The world's great libraries and archives continue to digitize and post photographic treasures. We publish this photo from the archives of the Rijksmuseum of Amsterdam. With its amazing resolution, this photo from the Bonfils studio reveals fascinating details, including the American Consulate inside the Jaffa Gate of Jerusalem's Old City. dates the picture as "circa 1895-1915." Several historical facts dictate it was taken prior to 1898. 1. The moat on the right side of the photo behind the shops was filled in in 1898 so that German Emperor Wilhelm's carriage could ride into the city through a breach in the wall. The picture, therefore, was taken before 1898. 2. 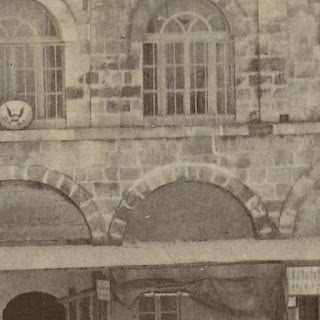 While attempts were made to appoint an American Consul already in the 1830s, the American Consulate was established in the Old City in the latter half of the 1800s. Centered in Bonfils' photo is the American Consulate building, obtained in 1857, with the U.S. seal on the second story window. Note the American seal (eagle) on the building. 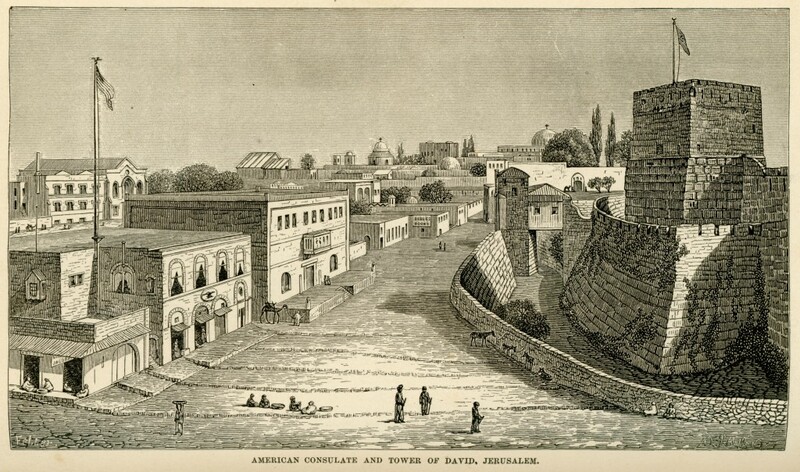 A drawing and blueprint of the building can be found in Ruth Kark's American Consuls in the Holy Land, 1832-1914. 3. Other oddities in the Bonfils photo include an advertisement for Bonfil's own photographs. Pictures and postcards were major tourist souvenirs. 4. Note the advertisement for the Thomas Cook Tourist Agency. Many of the major visits and expeditions to the Holy Land were outfitted by Cook's. 5. Also note the advertisement for "Valero." The Jewish Valero family arrived in the 1840s and opened the first private bank in the land. Their office was inside the Old City. A detailed feature on the Valeros appeared in these pages in July 2012. 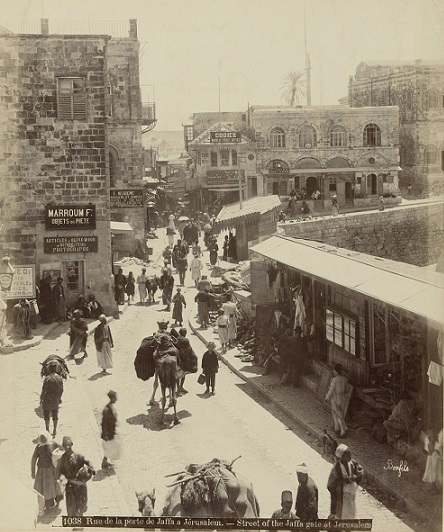 The family also held valuable areas of Jerusalem real estate outside of the Old City.